Support for local economies through increased local revenue, jobs for local populations, and use of local supplies and services thus helping communities to rise their standards of life. Increased environmental and cultural awareness which further encourages the local population to preserve its environment. 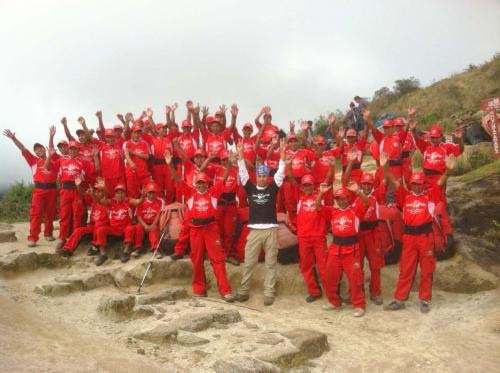 Our Porters (The Red Army) - are the best treated and are currently the best paid (as in May 2013) of all the porters on the Inca Trail. We provide them with good equipment, uniforms, insurance , good pay and vacations but that's the least that should be done for them (but not always the case with other agencies) and it's the extras we provide that really make the difference. Our porters are part of the Llamapath family and we treat them so; we provide them with clean and comfortable accomodation here in Cusco (many of them live several hours from the city) with an area where they can relax before treks. We also organise events for them such as parties to celebrate the beginning/end of the season as well as weekly football matches. The Porters House - In 2012 we began a project to make the lives of our porters even better by building them a new accomodation block with all the mod cons plus a community center and library to promote education and social mobility. Since Llamapath started we have provided accomodation for our porters; this is an important aspect of how we care for our porters as otherwise they may end up sleeping on the streets as most come from the communities around Cusco. <> Our commitment to the environment - As a tourist agency we feel that it is our responsibility to keep Peru pristine and beautiful for all the future generations to come. On all our treks we do everything we can to ensure we leave as little impact as possible. We educate all our tourists to be respectful of the Inca sites we visit and to always bring their garbage with them off the trek; as far as we can we use recyclable and reuseable products as well as environmentally friendly products and solar lamps; to keep our carbon footprint as low as possible the materials we use are Peruvian made. Cleaning up the treks - As you can imagine with hundreds of tourists trekking to Machu Picchu every day the routes can end up pretty dirty over the course of the year. Although we do our part of taking all our garbage with us not every agency is as aware as we are so we take the extra step of organising clean up treks during the off-season. With an army of porters at our disposal it doesn't take long to collect bags and bags of plastic bottles and other garbage and return the trekking routes to the condition you expect them to be in. It's a small thing but every little helps.